Simpetus has released Meep version 1.9 which includes an adjoint solver for sensitivity analysis and automated design optimization, subpixel smoothing for user-defined material functions, support for periodic boundaries in near- to far-field transformations, Jupyter notebooks for tutorial examples, energy-density spectra, and various other improvements. Simpetus has released Meep version 1.8 which includes oblique sources, user materials in conductivity, load balancing, visualization of chunks, improved stability of lorentzian susceptibility, array metadata, source slice, and various other improvements. Also released is MPB version 1.8. Simpetus has released Meep version 1.7 which includes multilevel atoms, GDSII regions in Python, dominant planewave output in eigenmode solver, dft-flux (etc.) computations in CW solver, Python local density of states (LDOS), geometry_center in Python, epsilon from NumPy array, and medium transform function. Also released is MPB version 1.7 which adds the maxwell_dominant_planewave function. Simpetus has released Meep version 1.6 which includes GDSII import in Python, source amplitudes from HDF5, symmetry support in mode decomposition, compatibility with the latest Guile and Python versions, integrated materials-library support, and structure dump/load for dispersive materials. Simpetus has released Meep version 1.5 which includes a Python interface for MPB, mode decomposition, DFT slices, prism objects, and more. Simpetus has been awarded a Small Business Innovation Research (SBIR) Phase II award from the National Science Foundation (NSF) for the project Automating the Design of Photonic Devices using Cloud-Based Computational Electromagnetics. The broader impact/commercial potential of this Small Business Innovation Research (SBIR) Phase II project is to provide quick and cost-effective access to anyone seeking cutting-edge, electromagnetic, simulation tools for research and development. This will involve automating the most technically intensive tasks required to accurately, reliably, and efficiently design and prototype photonic and optoelectronic devices. Current simulation tools require everything to be set up by hand which, even for trained experts, is time consuming and error prone. Also, the computational design and prototyping of photonic devices involves too much trial and error. Our turn-key, on-demand, cloud platform will: (1) reduce design time by 50%, (2) lower the unit cost of simulations by an order of magnitude, and (3) enable first-time users with no prior training in electromagnetic simulations to get up and running with manufacturing-ready designs in a matter of weeks not months. Our advanced simulation tools will facilitate enterprises and entrepreneurs with bringing products to market in a variety of industries critical to national security, health, and education. Easy-to-use and affordable design tools will also reduce the need to fabricate and test as many iterations thereby conserving environmental resources. This is the next generation of computer-aided design (CAD) tools to accelerate photonics innovation and discovery. The proposed project involves the development of a turn-key, electromagnetic, simulation platform which automates complex, multi-step tasks involved in the design and prototyping of photonic and optoelectronic devices. Photonics, the science of light, underlies critical technologies in telecommunications, networking, photovoltaics, biomedicine, photolithography, imaging, displays, and solid-state lighting. Phase II involves automating the deployment of finite difference time-domain (FDTD) simulations in four key areas: (1)large-scale shape optimization for devices involving tens to hundreds of degrees of freedom, (2) sensitivity analysis to assess the impact on device performance of manufacturing errors and predicting manufacturing yields, (3) launching simulation jobs using on-demand, scalable, high-performance computing (HPC) in the public cloud, and (4) seamlessly importing and exporting planar device geometries based on the standard Graphic Database System (GDSII) file format widely supported by electronic design automation (EDA) tools and semiconductor foundries. This will be made possible by combining advances in machine learning, nonlinear optimization, and computational electromagnetics. Simpetus has released Meep version 1.4 which adds a Python interface and several API improvements. Also released is MPB version 1.6 which adds Guile 2.2 support and magnetic materials. Dr. Ardavan Oskooi, CEO of Simpetus, will be an invited participant at the 2018 Japan-America Frontiers of Engineering Symposium to be held in Tsukuba, Japan from June 18-20, 2018. Simpetus will be presenting an invited hands-on workshop as part of the Lab Automation Hackathon at the Optical Networking and Communication Conference (OFC) in San Diego, CA on Sunday March 11, 2018. Dr. Ardavan Oskooi, CEO of Simpetus, will be an invited speaker at the topical workshop Computational Aspects of Time Dependent Electromagnetic Wave Problems in Complex Materials hosted by the Institute for Computational and Experimental Research in Mathematics (ICERM) from June 25-29, 2019 at Brown University in Providence, Rhode Island. Dr. Ardavan Oskooi, CEO of Simpetus, will be presenting a seminar at the MIT Center for Computational Engineering on Thursday May 4 at 12pm in room 2-105 on the MIT campus in Cambridge, MA. Lunch will be provided. The seminar is free and open to the public. Dr. Ardavan Oskooi, CEO of Simpetus, will be presenting a seminar at the National Institute of Standards and Technology in Gaithersburg, MD on Thursday March 16. Simpetus will be participating in the 2017 NSF SBIR/STTR Phase I Grantee Spring Workshop from March 13-15 in Arlington, VA.
Simpetus has been awarded a Small Business Innovation Research (SBIR) Phase I award from the National Science Foundation (NSF) for the project Automating the Design of Photonic Devices using Cloud-Based Computational Electromagnetics. This SBIR Phase I project involves the development of a turn-key simulation platform to automate electromagnetic design and modeling. This involves the integration of state-of-the-art open-source simulation engines with intelligent control software and cloud-based high-performance computing (HPC). Its three main benefits are to: (1) cut design time by at least 50%, (2) reduce operating costs by an order of magnitude via savings in labor and capital-equipment expenses, and (3) improve device performance, form factor, and energy efficiency by more than 10%. This tool enables the advanced manufacturing of new kinds of photonic and optoelectronic devices in critical industries including telecommunications, photovoltaics, biomedicine, photolithography, imaging, displays, and solid-state lighting. Its impact is to help propel US manufacturing competitiveness to the forefront of the $180B global photonics industry. This is the next generation of computer-aided design (CAD) tools. Dr. Ardavan Oskooi, CEO of Simpetus, will be presenting a workshop on MEEP and MPB on Wednesday November 16 to the Dallas IEEE Photonics Society at the University of Texas at Arlington. The event is free and open to the public. 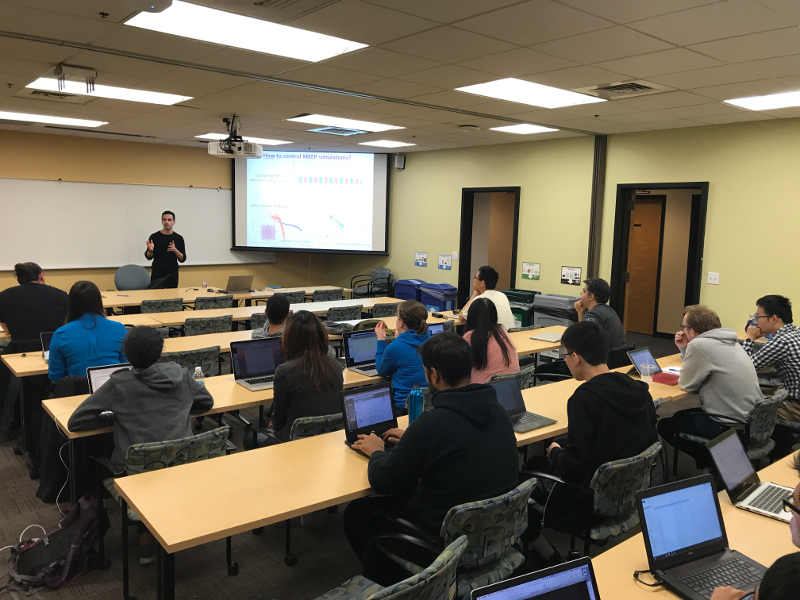 Dr. Ardavan Oskooi, CEO of Simpetus, will be presenting a workshop on MEEP and MPB on Wednesday November 9 at Stanford University hosted by the OSA/SPIE student chapter. The event is free and open to the public. Dr. Ardavan Oskooi, CEO, and Dr. Homer Reid, Technical Consultant, of Simpetus will be presenting a two-day symposium on open-source computational electromagnetics on Monday October 24 and Tuesday October 25 at the Boston University Photonics Center in Boston, MA. The event is free and open to the public. More information is on the symposium homepage. 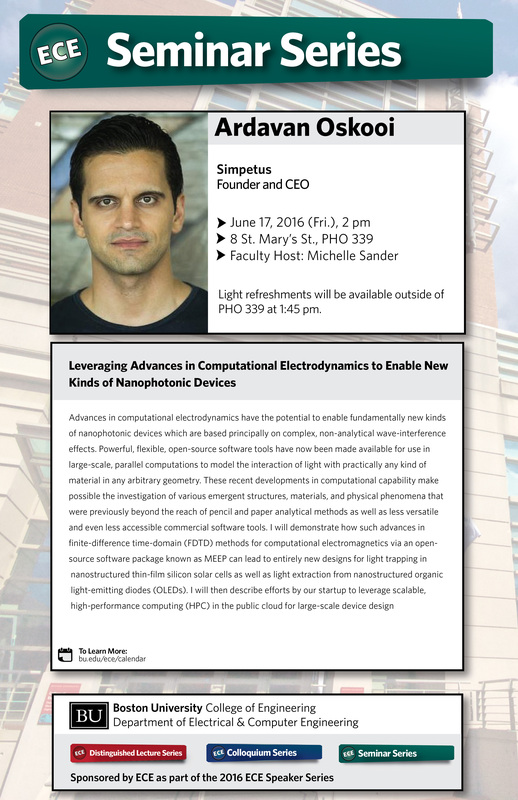 Dr. Ardavan Oskooi, CEO of Simpetus, will be presenting an invited seminar on Tuesday June 16 to the Columbus IEEE Photonics Society at the Electroscience Laboratory of Ohio State University in Columbus, OH. Dr. Ardavan Oskooi, CEO of Simpetus, will be presenting the Electrical and Computer Engineering (ECE) seminar on Friday June 17 at Boston University. More information is in the event flyer. Dr. Ardavan Oskooi, CEO of Simpetus, will be presenting an invited seminar on Thursday June 16 to the Boston IEEE Photonics Society at Lincoln Laboratory in Lexington, MA. Dr. Ardavan Oskooi, CEO of Simpetus, will be presenting the Physics department colloquium on Tuesday April 19 at the University of North Texas in Denton, TX. Dr. Ardavan Oskooi, CEO of Simpetus, will be presenting an invited seminar on Friday March 4 at the Center for Integrated Nanotechnologies at Sandia National Laboratories in Albuquerque, NM. Dr. Ardavan Oskooi, CEO of Simpetus, will be presenting an invited seminar on Thursday March 3 at the Center for High Technology Materials at the University of New Mexico in Albuquerque, NM. Dr. Ardavan Oskooi, CEO of Simpetus, will be presenting an invited seminar on Wednesday March 2 at the Center for Integrated Nanotechnologies at the Los Alamos National Laboratory in Los Alamos, NM. Dr. Ardavan Oskooi, CEO of Simpetus, will be presenting a colloquium on Thursday February 11 at the College of Optical Sciences at the University of Arizona in Tucson, AZ. A video recording is available on YouTube. Dr. Ardavan Oskooi, CEO of Simpetus, will be presenting the iOptics seminar at the University of Illinois at Urbana-Champaign on Wednesday November 4. Dr. Ardavan Oskooi, CEO of Simpetus, will be presenting a seminar on Tuesday November 3 at the Argonne National Laboratory in Argonne, IL. Dr. Ardavan Oskooi, CEO of Simpetus, will be presenting the Electrical and Computer Engineering (ECE) seminar on Thursday October 29 at the University of California, Santa Barbara (UCSB). Dr. Ardavan Oskooi, CEO of Simpetus, will be presenting the Solid State Technology and Devices seminar on Friday October 23 at the University of California, Berkeley. Dr. Ardavan Oskooi, CEO of Simpetus, will be presenting the School of Engineering seminar on Friday October 16 at the University of California, Santa Cruz (UCSC). Dr. Ardavan Oskooi, CEO of Simpetus, will be presenting the Applied Physics and Materials Science seminar on Friday September 18 at the California Institute of Technology (Caltech). Dr. Ardavan Oskooi, CEO of Simpetus, will be presenting the Electrical Engineering seminar on Thursday September 17 at the University of California, Los Angeles (UCLA). Dr. Ardavan Oskooi, CEO of Simpetus, will be presenting the Electrical and Computer Engineering seminar on Wednesday September 16 at the University of California, San Diego (UCSD). 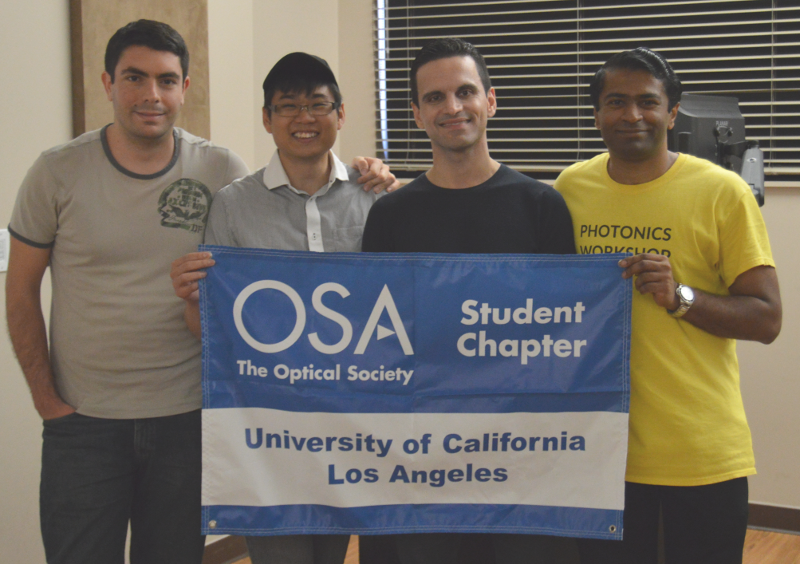 Dr. Ardavan Oskooi, CEO of Simpetus, will be presenting a seminar on Tuesday August 25 at Stanford University hosted by the OSA/SPIE student chapter.